Tomorrow’s the big day! New Jersey Emerging Arts Leaders (NJEAL) will host their third annual Creative Conversation on Thursday, October 20 at Arts Council of Princeton—“Upwardly Mobile: Successful Relationships with Mentors and Supervisors in the Arts.” The event will begin at 7:00PM and include a panel discussion and networking after-party. To learn more about Creative Conversations or the New Jersey Emerging Arts Leaders, check out ArtPride Executive Director Ann Marie Miller’s recent post on the Geraldine R. Dodge Foundation Blog. Interested in attending? Click HERE for event information. RSVP on Facebook or email madelineorton@artpridenj.com. Sean is a fundraiser at the League of American Orchestras, where he interfaces with orchestra enthusiasts, concertgoers, staff, and trustees to gain support for the League’s programs and services that strengthen orchestras everywhere. Formally educated as an orchestral bassist, the study of music led Sean to festivals in the U.S., Europe, and Asia, and earned him two degrees in performance from the University of Minnesota and Manhattan School of Music. Sean’s other interests include entrepreneurship, transhumanism, enjoying the outdoors, and geeky sci-fi stuff. Tiffany Rea-Fisher received her BFA from SUNY Purchase. After graduation she performed with Compania de Dance, Spain; The Kevin Wynn Collection, NYC; Dance Anonymous, Cyprus; Abraham.in.Motion, NYC and The Brett Howard Dance Company, NYC. Ms. Rea-Fisher joined Elisa Monte Dance in 2004. She was named Dance Magazine’s “On the Rise” person for their 2007 August issue. 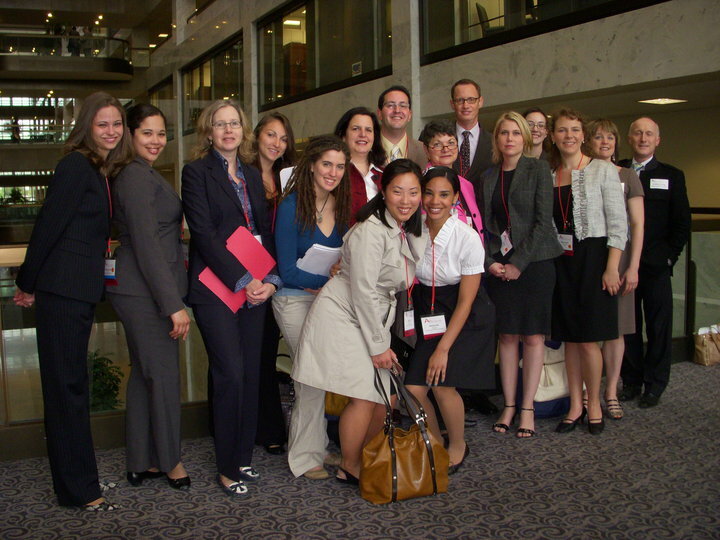 Ms. Rea-Fisher began her administrative work for the company in 2007. In 2009 Tiffany was promoted to Associate Artistic Director, and has now also added the title of Director of Operations. Kelly has worked in marketing or press relations for more than 100 regional theatre productions, nearly half of which were either world or American premieres. At George Street Playhouse since 2000, she is particularly delighted to have been Marketing Director for the world premiere productions of nine plays by Arthur Laurents as well as The Toxic Avenger and The Spitfire Grill — both of which moved from GSP to New York City and have been performed around the world. Off-Broadway, Kelly was a member of the marketing team for the The Toxic Avenger, which won the 2009 Outer Critics’ Circle Award for Best New Musical. She is regional chair of Jersey Arts Marketers, a board member of New Brunswick City Market, a member of the advisory board of Arts Plan NJ and serves on the marketing committee for The New Jersey Theatre Alliance. 4. …but technology isn’t the only way! 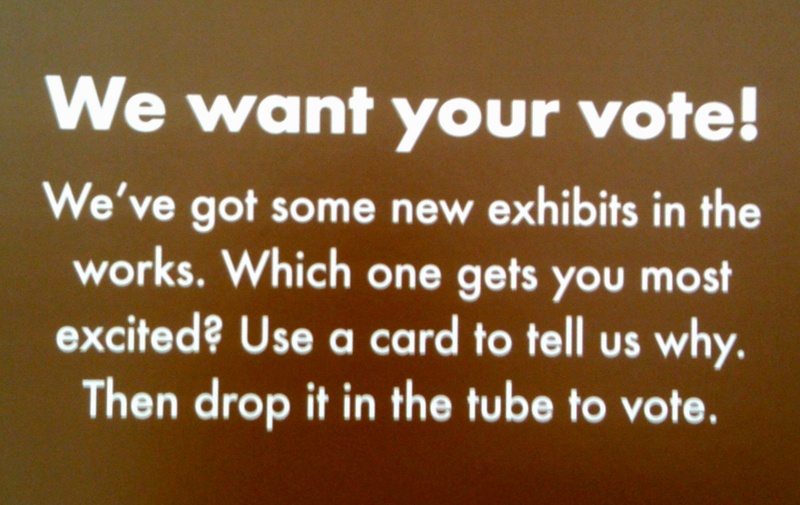 A placard at the San Diego Natural History Museum asking visitors to vote, based on brief descriptions and images, on the exhibit they are most interested in seeing at "The Nat." 3. As another attendee mentioned, there’s nothing quite like being surrounded by other arts administrators. Meeting people with a shared interest who come from completely different backgrounds is both bonding and eye-opening. The passions and challenges are similar and the ideas that accompany them can be inspiring. 2. The importance of advocating for the arts can’t be stressed enough! 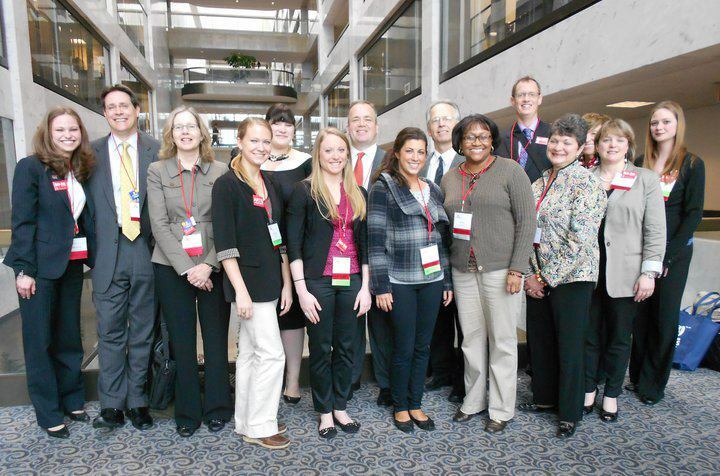 Throughout the convention I heard many compelling arts advocacy success stories—one from right in San Diego! However, I heard just as many attendees admit they were not aware of the role arts advocacy plays in their communities or how they can help. 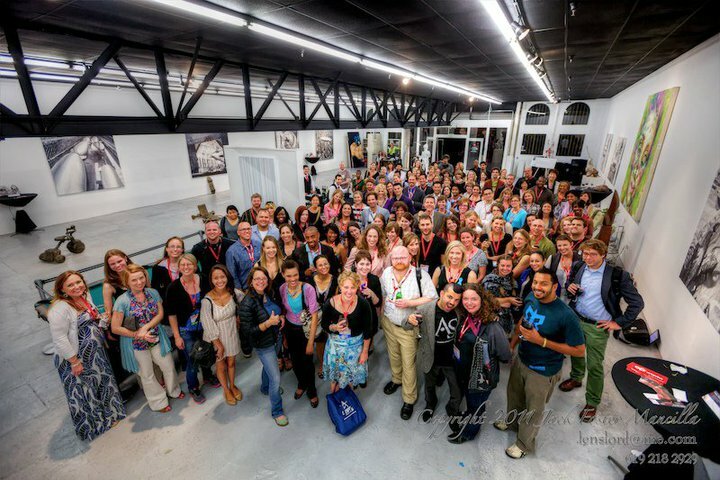 Here in New Jersey, you can get involved by simply becoming a member of ArtPride! Click HERE to learn more. 1. San Diego has some amazing art! And that’s what it’s all about, right? 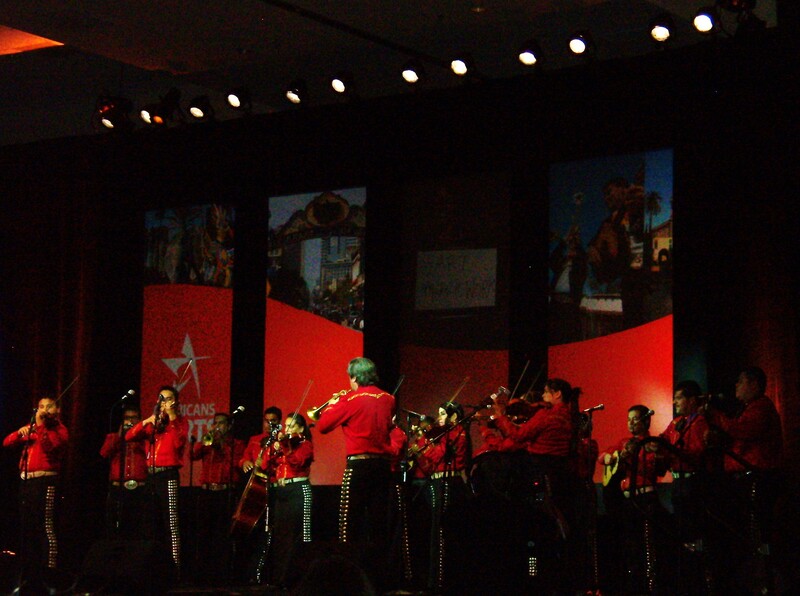 Southwestern College's Mariachi Garibaldi performing during the closing keynote. "Nature's Berth" by Anne Oshman-- Part of the Port of San Diego public art exhibit, Urban Trees 7. "Tree Pose" by Brennan Hubbell--Part of the Port of San Diego public art exhibit, Urban Trees 7. 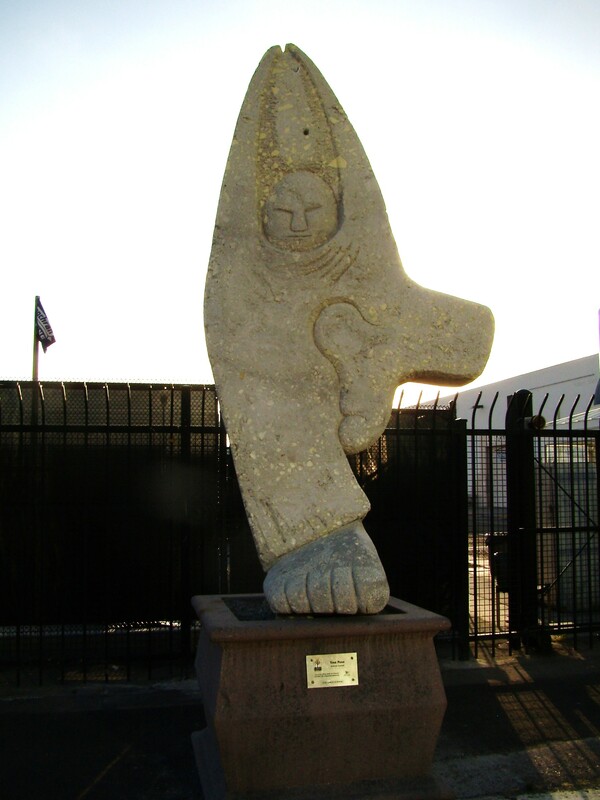 "Coming Together" by Niki de St. Phalle-- Part of the Port of San Diego Tidelands Collection. Want to see more Convention highlights? Visit the Americans for the Arts website for photos, blog posts, videos and more! Americans for the Arts has been selected as Hyundai’s designated nonprofit for a new Facebook Cause linked to their recent “Cure Compact Crampomitosis” advertising campaign. This means that through the end of March, Americans for the Arts will receive $.50 to help advocate for the arts & arts education for every person that joins the Cause, and if they reach 50,000 members, Americans for the Arts will receive the maximum $25,000 that Hyundai is offering. Hyundai is also matching any donations to A.F.T.A. made through the page, so be sure to visit http://apps.facebook.com/causes/570191 and support those who support the arts!